strategy, providing active SPI-200 traders a complete spectrum of trend timeframe-studies. 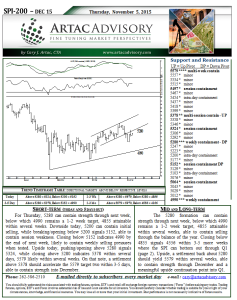 Each daily SPI-200 newsletter contains highly specific support/resistance price levels, descriptive charts, and noteworthy commentary, all blended into a cohesive trading platform of real applicability. Artac Advisory’s SPI-200 futures analysis began in 2006, when Sydney-based traders executing US contracts at the CME were referred to our work by CME clientele. This initial contact planted the seeds of what has become an expanding network of Australian traders and brokers making good use of our daily SPI-200 and 10YR Australian futures analysis. We’re always perfecting our product, and look forward to many years ahead of providing market research for the Australian futures trading community.